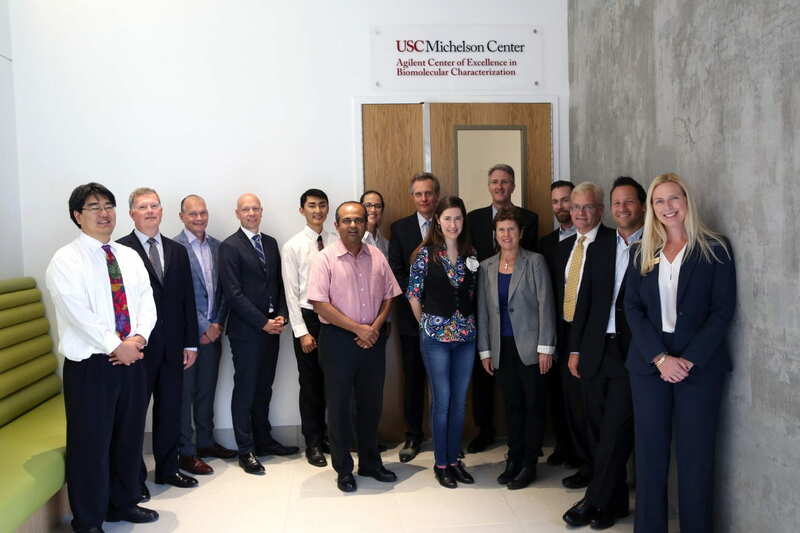 The Agilent Center of Excellence in Biomolecular Characterization in the USC Michelson Center for Convergent Bioscience is the cornerstone of a larger partnership between USC and Agilent to accelerate fundamental discoveries in life sciences research. The Center of Excellence houses Agilent’s industry-leading instrumentation for biomolecular characterization. A suite of advanced tools that powers bio-sensing and detection, proteomics and metabolomic analysis, as well as protein engineering, will enable our Michelson researchers to achieve the goal of characterization of single cells at the molecular level. These tools include high-throughput automated chemistry, genomics, optical spectroscopy and the very latest mass spectrometry. Complex biological systems can now be studied using powerful and exquisitely sensitive molecular-level probes. Beyond the physical structure and its state-of-the-art instrumentation, this building is a catalyst for a broader and deeper USC-Agilent partnership. The Agilent Center of Excellence spans the instrumentation suite inside the laboratories of Valery Fokin, Eun Ji Chung and Cristina Zavaleta and the characterization facilities of the Center for Peptide and Protein Engineering, directed by Rich Roberts. Gas and liquid chromatography, triple quad and time-of-flight mass spectrometry, UV-vis, fluorescence and FT-IR, and quantitative PCR power research in the Michelson Center and across USC’s campuses. Finally, within the Department of Chemistry mass spectrometry suite, an advanced Agilent 6545 QTOF with LC front end is routinely available to campus groups for research use; it also powers training in contemporary instrumentation as part of USC’s undergraduate lab courses.